In the minds of Winnipeg Jets fans, Toby Enstrom has done the team a service. While the Jets have been mum, as usual, on whether they asked Enstrom to waive his no-movement clause ahead of the expansion draft, word came from the veteran defenseman’s camp yesterday that he had indeed been approached, and had agreed to put the team’s best interests ahead of his own. As you can probably tell, this is going to have rather a different tone than my last article on Enstrom just over a week ago. There was some anxiety then over what might happen to the Jets when the time to submit their protected list came if he chose not to waive his NMC. Who would be exposed then? Enstrom, however, has laid all of that speculation to bed, and the organization owes him one for it. Jets asked Enstrom to waive NMC a few wks after season. Tobi agreed to waive soon after. Papers signed roughly 3 wks ago. Well-kept secret. Make no mistake, the former Olympian did not have to waive his right to refuse to be exposed. He could have put Winnipeg in the difficult position of having to protect four defensemen and expose one of their promising forwards, which would almost certainly have meant the loss of Adam Lowry or Mathieu Perreault. Enstrom, however, chose to risk exposing himself to a team that his agent has stated he doesn’t want to go to for the good of the Jets. It’s a classy move, and it shouldn’t be swept under the rug despite the madness that’s about to engulf the hockey world. Is This Goodbye for Enstrom? As his agent outlined, Enstrom is not keen on a trip to the desert to play for an expansion franchise. In fact, he’s genuinely happy to stay in Winnipeg, something that, given the Jets’ consistent place on player’s no-trade lists, is no small thing. He’s played for no other franchise in his career and is one of the only players on the team who can say he not only played for the Atlanta Thrashers but was drafted by them. So might a selfless act by Enstrom be his last with the only franchise he’s ever known? It’s possible. Las Vegas is going to be a young team. They’re stocking themselves up with draft picks (some insiders say they already have as many as three first-rounders) and they’ll need a skilled, veteran defenseman to help bring those young players along. Enstrom may fit that bill. On the other hand, Enstrom wouldn’t come cheap. His 5.75 million dollar contract is a lot to eat, and it expires after just one year. Would Vegas use a pick and spend 5.75 million dollars on a player who has publically stated he doesn’t want to go there? Do they use those resources and risk Enstrom jumping ship in free agency after just one season? There’s a certain opportunity cost in taking Enstrom as well. 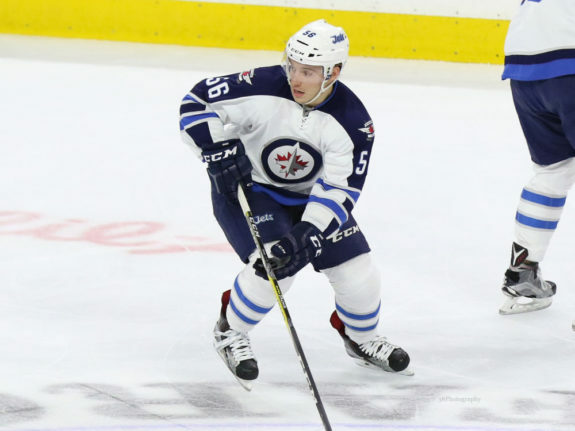 It looks increasingly like the Jets will dangle Marko Dano, who’s young and skilled and can play up and down the lineup. It’s true he’s been moved around a lot in his young career, but Vegas might give him the opportunity to stick in a lineup he’s been missing, and they could reap big benefits from that for years to come. He might be of greater interest to them than a player with Enstrom’s age, price tag, and recent injury history. 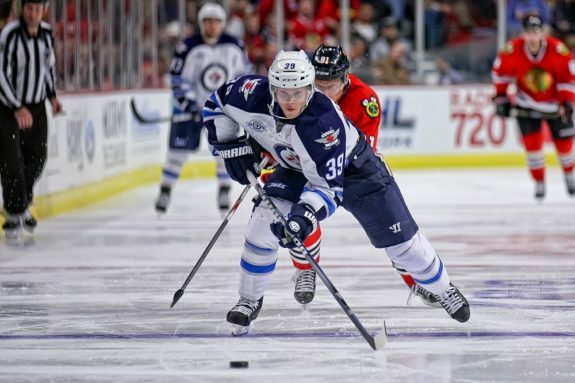 This may not be the end of Enstrom in Winnipeg. The Jets must hope not. As outlined in my previous article on him, the Jets lack an immediate suitable replacement. The left side of this team is thin enough without removing Enstrom from the mix, and nobody in the system is ready for that responsibility yet. We all knew the Jets were going to lose somebody good in the expansion draft. Who that would be has been hotly debated, as it has been for all 30 teams, but if the Jets had to protect four defensemen they would have lost someone far more valuable than they’re likely to now. While Vegas must be slapping their forehead each time they’re denied a promising young player (as teams do everything in their power to deny them that), the Jets can breathe a sigh of relief. Enstrom’s agent said he believes in the direction this team is taking and believes in the future. Thanks in part to his own selfless choice, the nucleus of the team Enstrom has so much faith in has been allowed to remain intact. For that, I hope Enstrom himself is around to see their success firsthand. He’s been part of the franchise without any success for his whole career, and it would be nice to see him stick around with success seemingly closer than it’s ever been in Winnipeg. Now more than ever, the Jets owe him that much.